Design your own bed sheets for a totally unique night's sleep. Your personalised bed sheets are made from soft, breathable microfibre, and are available in six sizes, ranging from cot to emperor. Printed with your unique photos and handmade to order, these are the perfect way to make bedtime extra special. Design your own and include optional custom pillowcases too for the set. Getting into bed is possibly the best time of day, and it's even better with these personalised bed sheets. Expertly printed all over and handmade to order, your photos come alive in the morning and night. Choose photos or inspirational quotes that make you happy, so you can de-stress before you go to sleep. This is ideal after a long hard day when you need to unwind. Made from specialist microfibre fabric, your printed bed sheets are soft, breathable and moisture wicking, helping you to stay cool and comfortable as you drift off. Design your own bedding set in its entirety. In the design tool, you also have the option to add one or two personalised pillow slips. This is perfect for creating a beautiful bedding gift set. 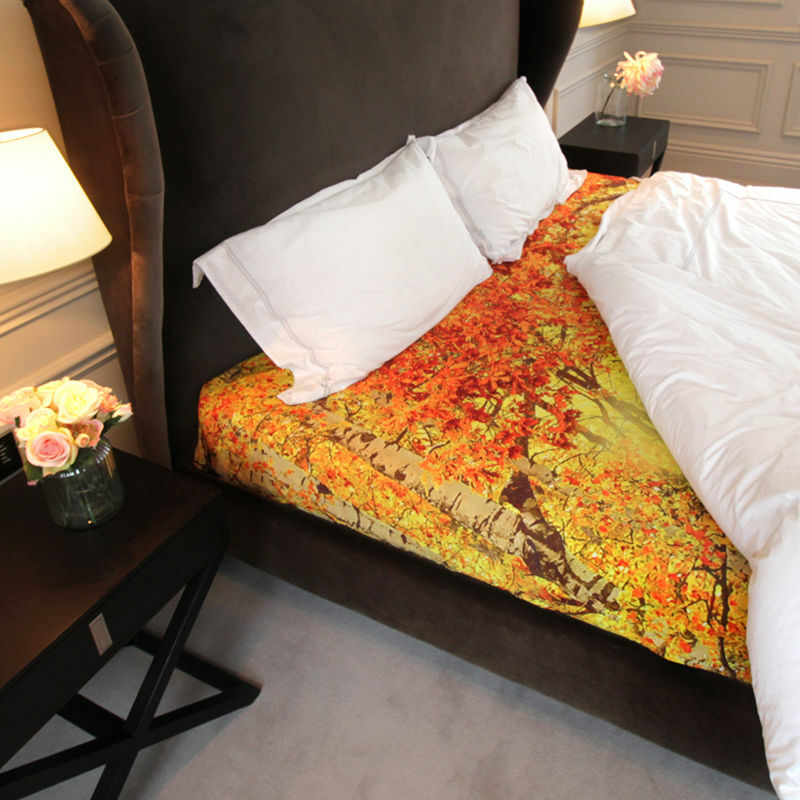 Choose the same design as your bed sheets or go for something different and contrasting. They are single slips for existing pillows and don't come with a pad. I opened up the bag when I got home and was so stunned at the sheets, it really does look awesome, I've asked the Mrs if i can do another one of her only and she said go for it, thanks heaps looking forward to the next one. Always remained in contact letting me know the status of my product. When it arrived the product was better than i ever expected. Delivered exactly on time. We print on the wonderful microfibre material which comes on rolls. It is 150cm wide so if we are making anything wider, two or more panels need to be stitched together. This means each sheet, excluding cot size, has at least pne unavoidable seam and we position it sympathetically to the image or design. Care Instructions: Microfibre sheet washable at recommended 30 degrees C, tumble dry. If dried flat, no ironing required. 3 year guarantee for print and finish quality. Offer: Buy two personalised bed sheets and add another one to the basket for free. Design your own bedding sheets today and make bedtime extra special. Handmade to order by our team of expert print technicians and seamstresses, your personalised bed sheets exude luxury and charm. Specialist inks are used which bond to the fibres of the fabric, ensuring a permanent print and producing vibrant colour and sharp details. Printed all over with your unique designs and favourite photos, the microfibre fabric is cut to size and sewn together to create a truly bespoke bedding gift. For all sizes except the cot, separate panels of fabric have to be sewn together, resulting in a slightly visible seam. You can choose from four stitching patterns to ensure your design isn't affected - see the patterns below. Printed bed sheets for housewarming gifts are thoughtful as well as practical. Do you have friends or family that have recently moved in together? Celebrate this occasion and gift them with a totally original housewarming present, you can even make a 'his and hers' bedding set. Create a collage bed sheet, printed with all the happy photos you've taken since you've known them, and a good luck message for the move. It's not only practical and fun, but it's a sentimental keepsake too. A bed sheet with a pattern made of a repeating face would make a great gift for someone leaving for university, or for an enthusiastic super-fan. Create personalised bed sheets for children and get creative. Turn bedtime into something your children look forward with their very own cartoon or animal printed bed sheets. Featuring 'Goodnight (Name)' or 'Sweet Dreams (Name)' from their favourite cartoon character or pop singer, they might be encouraged to settle down and drift off to the land of nod. Design your own bedding for Christmas. Turn the whole house into Santa's Grotto, including your bedroom, and design bespoke bed sheets. Printed with a festive family photo or a winter wonderland scene, it's the perfect way to get into the spirit. And what's more, even if it's not snowing outside, you can always get into bed and pretend it is.